1980 Tennessee inspection sticker (Memphis) - $20.00 : Bob Hoyts Classic Inspection Stickers, Add a Final Touch to your Restoration! 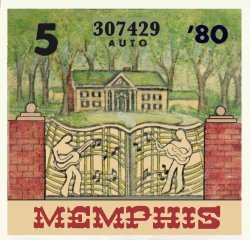 Here is a 1980 Memphis Tennessee sticker depicting Graceland, the home of Elvis. Buyer can customize this sticker with your own license plate number where the serial number is now located for an additional $10.00.